Here’s what some of you did! I love prepping complete meals instead of just components because that way I have no excuses not to make a home cooked meal when I’m short on time. I usually don’t mind eating similar meals throughout the week either. If it’s something I love then I definitely don’t mind! 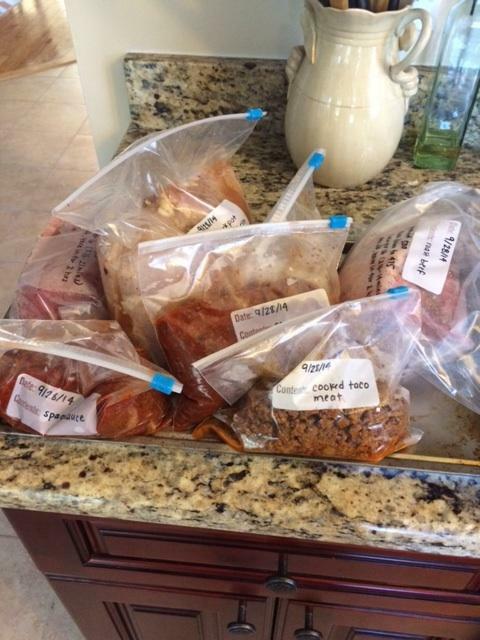 I’m expecting my first baby this December, so I started some freezer meal prep today to stock up. I’ve heard time and time again from friends that’s the best prep you can do because it pays off later to be able to throw something in the crockpot when you’re super tired. I made taco meat, spaghetti sauce, meatloaf, two roast beefs and have one crockpot Mexican chicken for the freezer and one cooking for tonight. I also bag up grapes and boil eggs for snacks during the week. I have fall fever, even though it’s still in the 80’s in Atlanta! 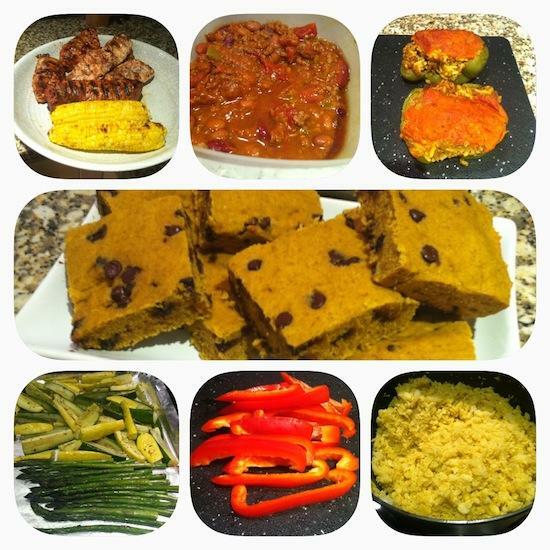 So, this week I made a crockpot full of chili and pumpkin chocolate chip bars. Still technically grilling weather, so I also made grilled chicken, pork tenderloin and grilled corn. Back inside, I prepped some red pepper, roasted yellow squash, zucchini and asparagus and made some mashed curry cauliflower. Finally, stuffed green peppers. 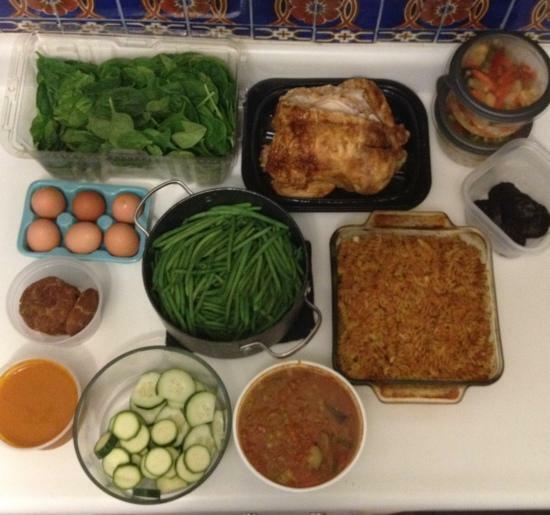 Per my usual routine, all of this will be used for lunches during the week and a probably a couple dinners as well. The pumpkin bars will be GREAT for breakfast and snacking! Thanks for including my prep pic! I really want to make that Paleo Snickerdoodle recipe now. I need to get on the pre-meal prep train so that cooking doesn’t get in the way of my online work … thanks for the inspiration! 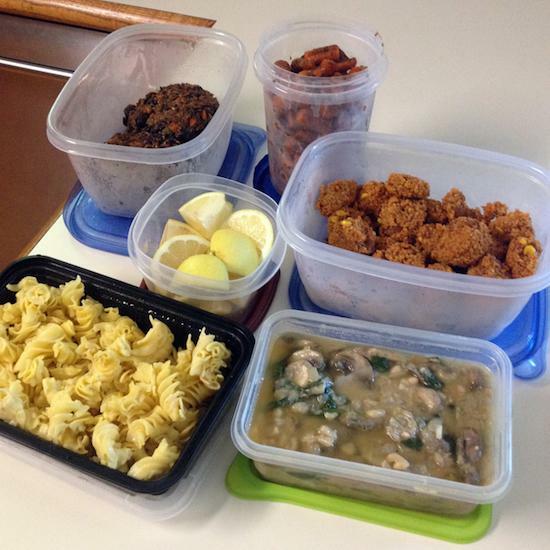 I start off food prepping and then I basically make a huge dinner and we eat little bits of it all week. I will send you pics of today. Babies, Babies, Babies! First comes Baby Bean, then in December for Tricia and me! 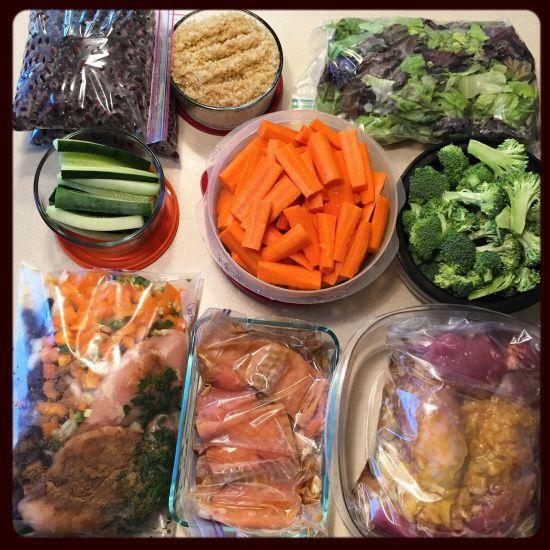 It’s time I get on the freezer meal prep wagon too. Another food prep Sunday!? I keep meaning to do some and take pics and then another post pops up because a week has passed already!